There are some people who practically live at the synagogue. In New Orleans, it will soon be possible to live in a former synagogue. Gregg Morris is turning the former Shaare Tefillah building, which dates back to the 1860s, into one- and two-bedroom apartments. Originally from Los Angeles, he moved to New Orleans three years ago “on a whim.” A friend of his had moved to New Orleans a few years earlier. Then, “when I found out the history it was more amazing.” The plan is to restore the appearance as close as possible to the original design, and to use as much of the original material in the building as possible, such as the hard pine and cypress materials. The original brick walls will be exposed as much as possible inside the apartments. Construction began in August, and the project is nearing completion. The apartments start at 650 square feet and include off-street parking. A double staircase that was originally in front of the building is being replicated to allow access to the second floor. When they pulled out framing that was added around the front doors of the sanctuary by later owners, they discovered a long-forgotten sign for Shaare Tefillah, covered up for decades. They carefully removed it, it is being restored and will be put back. The first floor, which would be where the social hall was, is being split into five apartments. The sanctuary was upstairs. An owner after the congregation moved in 1920 split the floor with the sanctuary into two floors, putting in a third floor at the level of the balcony. Morris decided to keep the structure underneath the balcony visible. For that reason, the four second-floor apartments have sloped ceilings leading to the exterior walls, with the joists that held the balcony rows as a visible feature. On the third floor, there will be three apartments — two in the front and one 1,700-square-foot penthouse across the entire back. Two things influenced that decision — the angle of the morning sun through the windows, and a huge arch spanning the eastern wall of the building, above where the ark was. The third floor apartments will be split-level, with loft areas overlooking the living rooms. The open lofts, which are inside the roof level, will allow for natural light coming from the windows in the living room level below. The penthouse loft has a view of the entire arch, Morris noted. They rebuilt the original spiral staircase that led up to what was the balcony, and it will lead to the landing for the front two apartments. After the synagogue was deconsecrated, it was used as a school, a storage facility and offices. Prior to Morris’ purchase, it had been vacant for several years. 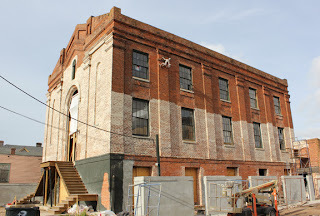 The project is one part of a revival along Jackson Street. Morris is hopeful that plans pan out for development of the five-story former River of Life hospital across the street, which has been vacant since 1979. What is now Gates of Prayer in Metairie began as the Jewish Benevolent Society of Lafayette in 1849. At the time, what is now the Garden District was called Lafayette City. The group started having services and formally became Shaare Tefillah, Gates of Prayer, in 1850. Then an Orthodox congregation, Gates of Prayer met in rented spaces for years, then bought the lot on Jackson Avenue in 1859. During the Civil War, congregants hid the bricks that were going to be used for the building so they would not be confiscated. The cornerstone was finally laid in 1865 and the building was dedicated on April 5, 1867. Gates of Prayer originally conducted services in German, migrating to English by the end of the 19th century. In 1904, the congregation joined the Reform movement, following Temple Sinai and Touro Synagogue. After World War I, a growing Gates of Prayer built a new facility on Napoleon Avenue, then an education and social center five years later. The move to Metairie came in 1975.